Question #66: What are two prerequisites that must precede God declaring a sinner righteous? 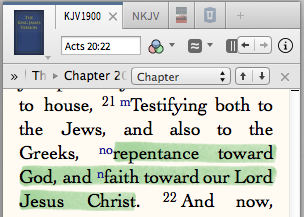 Repentance and faith toward Christ. Answer: The two prerequisites that must precede justification are repentance and faith toward our Lord Jesus Christ (Rom 1:17; Gal 3:11; Ac 20:21). Then God declares you righteous! Moreover, these are not necessarily two separate things but two sides of one coin–going together. “For therein is the righteousness of God revealed from faith to faith: as it is written, The just shall live by faith” (Rom 1:17). “But that no man is justified by the law in the sight of God, it is evident: for, The just shall live by faith” (Gal 3:11). Previous Previous post: What does it mean to be “justified” before God? Next Next post: Did God die only for believers or for the whole world?